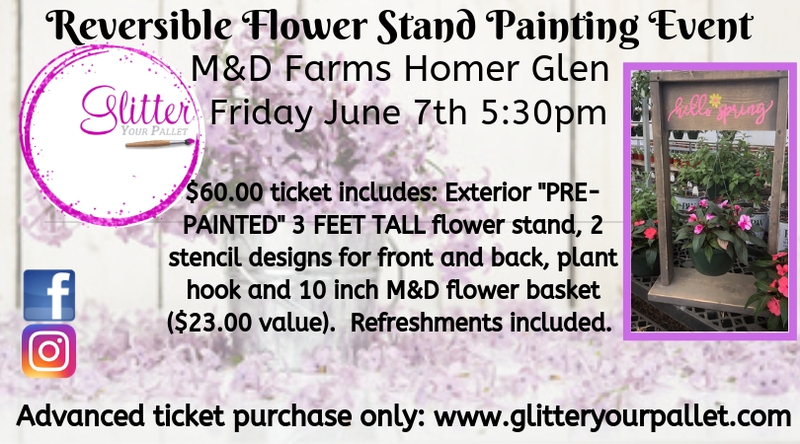 M&D Farms welcomes Glitter Your Pallet for the “Reversible Flower Stand” painting event. 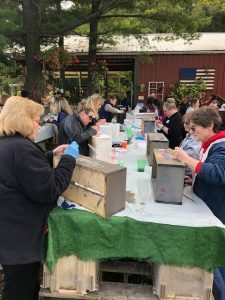 Join us Friday afternoon for sunset painting in the garden on June 7th @ 5:30 pm. Please note*** wear appropriate clothing for our outdoor event. HUNGRY? Light snacks will be served. THIRSTY? Lemonade and Spiked lemonade will be served. Feel free to BYOB. 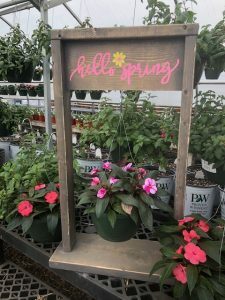 $60.00 per project includes: an exterior pre-stained stand (measuring 3 feet tall x 26″ wide), installed hanging hook, all supplies, step by step guidance, 2 stencil design choices (one for front / one for back) and a 10″ M&D flower basket. Be sure to shop the other amazing flowers, plants, produce, perennial flowers, hanging baskets and organic honey. Out of stock! 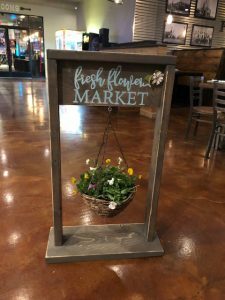 Reversible Flower Stand $60.00 $60.00 per project includes: an exterior pre-stained stand (measuring 3 feet tall x 26" wide), installed hanging hook, all supplies, step by step guidance, 2 stencil design choices (one for front / one for back) and a 10" M&D flower basket.